During the past 10 years, Matrix PDM has been the leading design and builder of large thermal vacuum chambers. Over the past 55 years, Matrix PDM has designed over half of the large, field erected thermal vacuum chambers in the United States. Matrix PDM has been involved in the design of more than 70 large vacuum chambers, most of which contained thermal systems, for aerospace companies and government laboratories. Matrix PDM designed its first vacuum chamber in the early 60’s in support of the NASA space program, which was just beginning at that time. Matrix PDM provides comprehensive, multi-discipline engineering solutions with industrial leading expertise in thermal vacuum chambers. Markets that Matrix PDM serves include aerospace, government research and manufacturing. Matrix PDM can provide a complete tested turn-key facility including all required engineering disciplines: process engineering, civil/structural, piping, electrical, instrumentation and control. 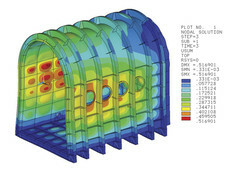 In addition to designing thermal vacuum chambers for testing satellites and spacecraft, Matrix PDM has been involved in the design of large vacuum chambers used for fusion energy research. Matrix PDM Engineering begins advance procurement for thermal vacuum chamber at Lockheed Martin’s new Gateway Center.